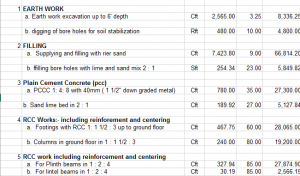 Construction cost estimating is the process of forecasting the cost of building a physical structure. Here we will give you estimates in building construction sample spreadsheet to determine a project’s scope and feasibility and to allocate budgets.This estimate shows required materials, labor, time to complete the project, complete cost details and overhead and also contractor profit. It also includes insurance, bond, equipment and other necessary things that need to complete the project. You can download spreadsheet on link below.